My latest finish has been a secret for the past month, but now I get to share it with you. I was busy as a bee in April working on two projects for Jacquelynne Steves’ The Art of Home Club. This sweet little bee hive pincushion and embroidered vintage bee pillow are the latest patterns available for April. I discovered that I am still a beginner when it comes to embroidery. I was so slow! And my stitches were uneven. And my eyes are old so it made everything that much harder. But I persevered and I love the results. If you’re already a member of The Art of Home Club, you have some beautiful patterns and ideas to look forward to. If you’re not a member, Jacquelynne will be opening up memberships in the summer. 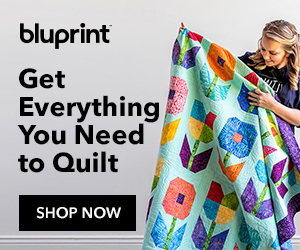 It’s a small, monthly fee and you receive a new project each month along with a collection of adorable embroidery patterns, how-to videos, club discounts, bonus projects, free BOM access and more. Don’t worry, I’ll remind you when enrollment is open! My work in progress – well there are many. I have actually walked into my sewing room, turned around and walked back out because I didn’t know where to start. There are SO many projects that need to be completed, or they are ongoing (monthly) and so many that have been waiting for me to start. What I ended up diving into is this cute pattern, Sewing Patchwork, from Fig Tree Quilts. I love the whimsical prints and timeless blocks that are part of this quilt. I got all of the fabric cut and these two scissor blocks sewn together. And guess what? They’re not paper pieced, which is a big bonus in my book. I’m sure the pattern could have been written for paper piecing, but it uses traditional stitch and flip techniques. That’s all I’ve got to show for now. We leave for Austin tomorrow morning and I can’t wait to see my little granddaughter! I’ll be taking lots of pictures so be prepared! Have a great weekend everyone! Your bee pillow is so cute – nice job. I just love your bee themed pillow and hexi pincushion! Your hand stitches make them so beautiful! And I love seeing the black scissors in the Sewing Patchwork quilt! I look forward to seeing this quilt grow! Bee Pillow absolutely beautiful and Hexi pin cushion so cute, love your work, so tidy and nice colours too.